Card designed by Anne McChlery in the early 1990s. Courtesy of Dorothy Fall. 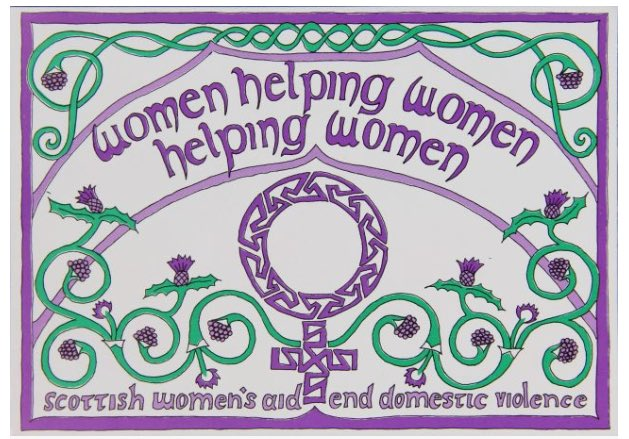 The Women’s Aid in Scotland archive dates from the organisation’s formation in 1976 and covers local, national and international campaigning throughout its history, as well as transcripts of all of the oral history interviews captured by the Speaking Out project. The collection contains material including minutes of the executive committee, annual reports and newsletters from many local groups, photographs of protests, awareness-raising posters, and press releases showcasing the activities of Women’s Aid in Scotland. There is also an extensive collection of news cuttings within the archive charting attitudes towards violence against women and highlighting individual cases, national campaigns and legislative change. Please browse the collection here. If you would like to access any of the material, please contact Glasgow Women’s Library archivist Nicola Maksymuik. If you would like more information about the Speaking Out project please contact Scottish Women’s Aid.